A lip piercing is a type of body piercing that penetrates the lips or the area surrounding the lips, which can be pierced in a variety of ways as you can see below. Lip piercings are a common practice in many parts of the world. 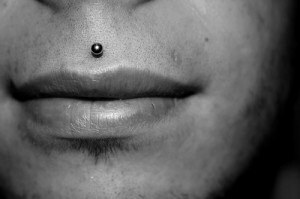 In some parts of Africa, it is common for lip piercings to be done on young men who become of age after getting initiated. Lip piercings have always had a kind of religious significance across various cultures since as long as history has been recorded. The Nuba tribe of Ethiopia, as well as the Dogon tribe of Mali, have specific piercings that represent the rung of the religious hierarchy the wearer occupies in the tribe. Lip piercing has also become a common practice in today’s youth and society everywhere in the world. It reflects a sense of individual style. It is one of the least painful of all types of piercings. This might be the reason why most people prefer lip piercings to piercings on other parts of the body. Lip piercings can be referred to as either facial or oral type of piercing. 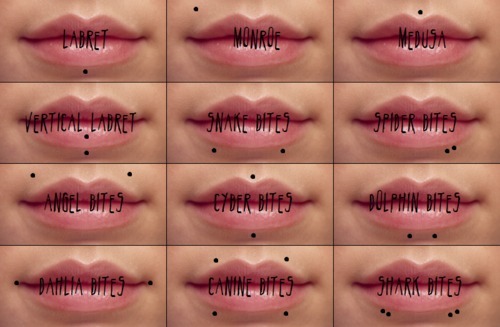 There are various types of lip piercings that are thoroughly discussed below. 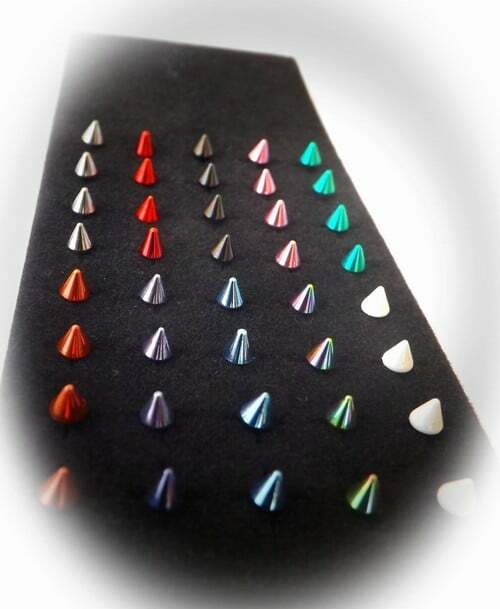 Below you will find the 12 most common lip piercings explained with a short summary, for more detailed information about lip piercing healing times, after-care, costs or just inspirational examples of our piercing models click on the links to all our other lip piercing information guides and lip piercing jewelry from our trusted partners. A labret piercing is often thought of like a lip piercing however, labret piercings are not actually attached to the lip. The labret is done under the lip just above the chin. However, there are other choices of the position depending on your preferences. Find more information and inspiration in this extensive guide about Labret and Vertical Labret Piercings. This lip piercing is named after Marilyn Monroe since it is done with an effort to resemble the late star’s birthmark. The piercing is on the left-hand side on top of the upper lip to the side. 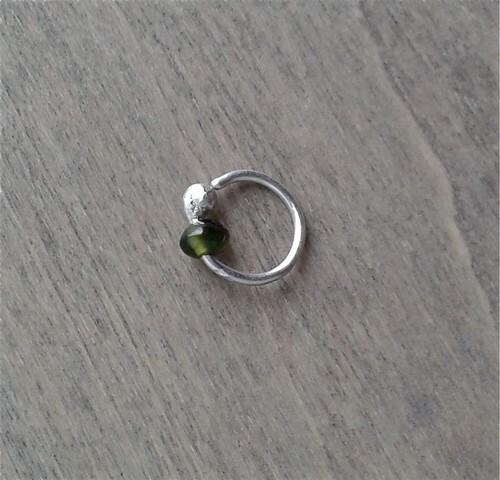 Usually, a labret stud is worn in this piercing. This piercing is typically fitted with a 14, 16, or 18 gauge labret, the bars of which are usually shortened after healing. A variation on this piercing is Angel bites – a double version of this piercing with both the Madonna and Monroe style Piercings worn on either side of the upper lip. A Madonna Piercing is a labret placed in the upper lip, off-center on the right, in the same place that a number of starlets have beauty marks (moles). 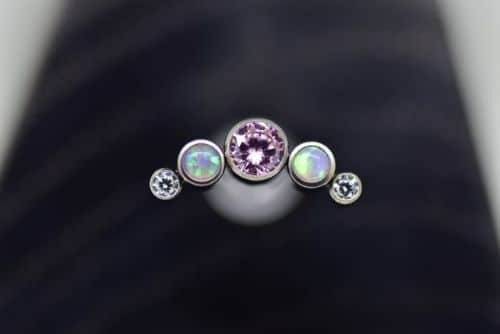 Jewelry is often around 14 gauge labret studs or even jeweled labret studs. The difference between a Monroe and Madonna piercing is the side of the face where the labret is placed; a Monroe piercing is placed on the left side, a Madonna piercing is placed on the right side of the face. This is a piercing done on the philtrum region just below the nose, therefore officially called a philtrum piercing. It is placed directly under the septum of the nose and it is crucial to get this piercing right since if placed in the wrong way, it can alter the face symmetry. A Medusa Piercing is typically pierced using a labret stud as jewelry, with the ball sitting outside of the mouth in the dip of the top lip. 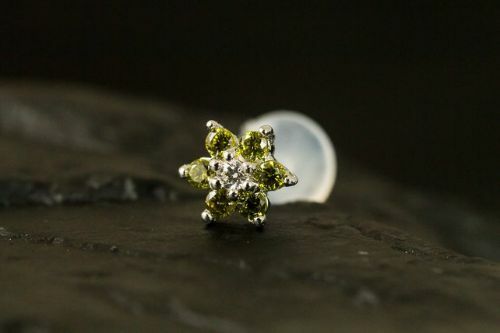 A variation of the philtrum piercing is a jestrum, where the piercing is placed vertically through the lip using curved barbell so both beads are visible. 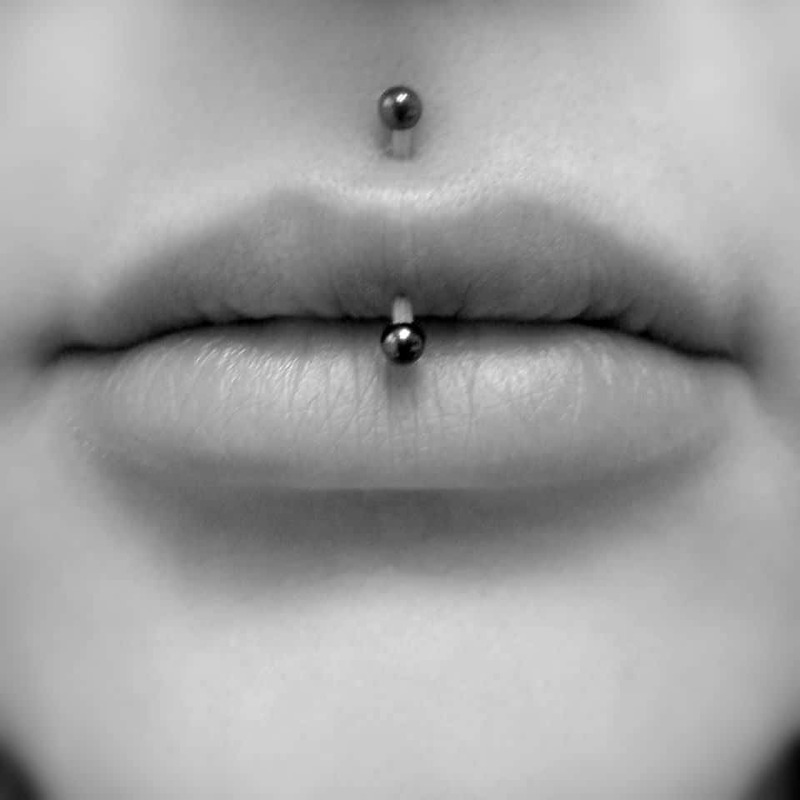 A Jestrum Piercing is very similar to the vertical labret piercing but done on the top lip like the Medusa Piercing; therefore also known as a vertical medusa. It is placed in the philtrum of the upper lip, directly under the nasal septum. 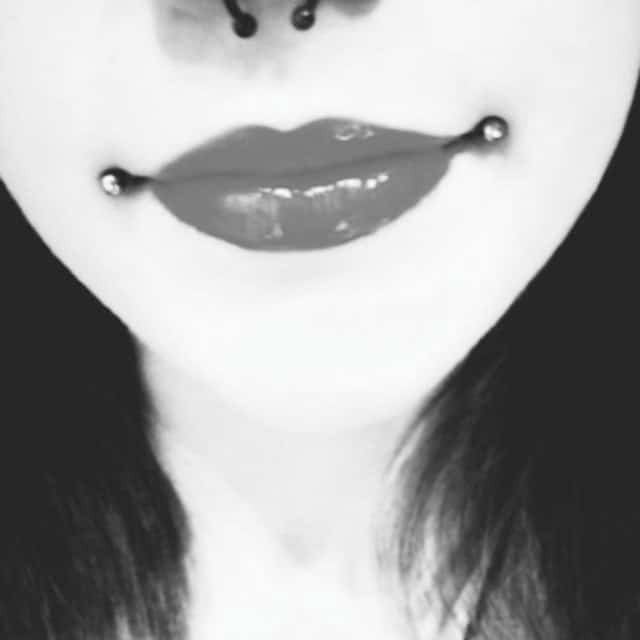 Unlike the similar medusa piercing, a jestrum piercing uses a curved barbell, and both ends of the piercing are visible externally with the lower part of the bar-bell curving around the underside of the upper lip. Sometimes it is combined with a lower labret piercing to form a symmetrical look. 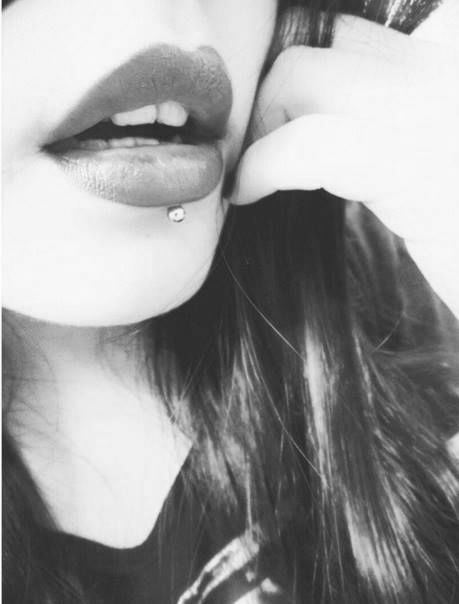 This kind of lip piercing is similar to the labret piercing. 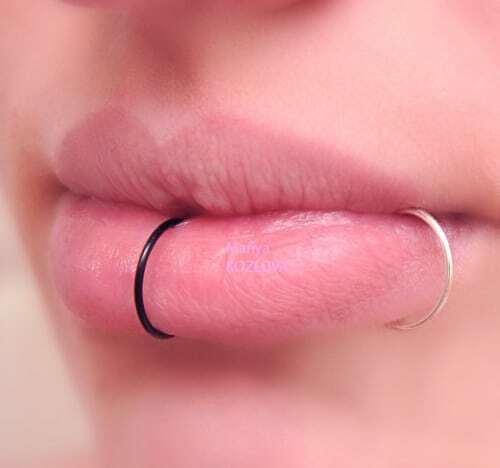 The vertical labret piercing is a piercing where the lower bead would be the same place where a normal labret piercing would be, which is just below the lip. The difference is that instead of passing through to the interior of the mouth, it goes in the upper direction coming out at the top or even slightly forward on the lower lip. With this type of piercing, you will be able to see both sides of the piercing. Most people use a curved barbell as jewelry in such piercings. Find an extensive Labret Piercing Guide with 31 Inspirational Examples here. A Snake Bite Piercing consists of two piercings evenly separated on the lower lips. 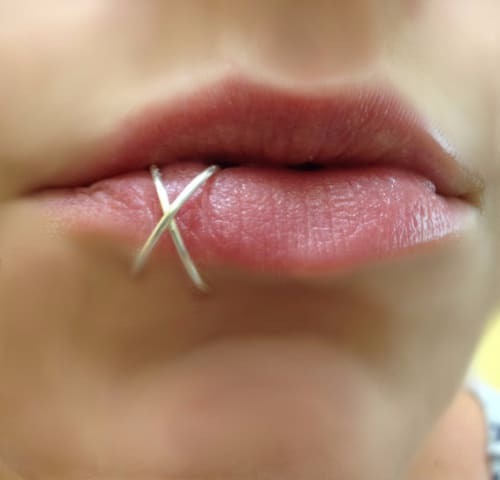 Whereas a labret piercing is placed in the center, under the lip, the snake bite is a lip piercing set of two and are placed on the left and right side of the lip. There are two kinds of snake bite piercings: The ring piercing and the labret stud under both sides of the lip. It is possible to get both piercings at the same time. More information about snake bites you can find in the Ultimate Snake Bites Piercing Information Guide. 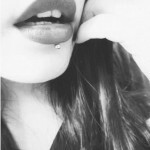 The Spider Bites Piercing or Viper Bites Piercing is a pair of piercings that are close together and on the bottom lip. These are similar to snake bites but are closer together compared to the snake bites. It is more painful and should, therefore, be done one at a time. This means that you should wait until one piercing heals in order to get another. 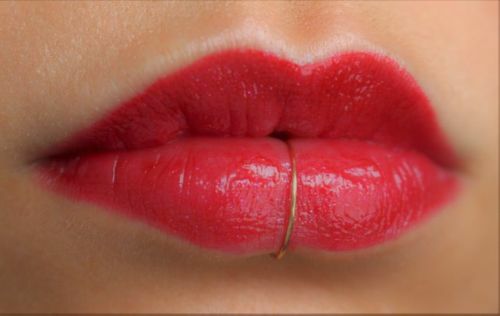 The Angel Bites Piercing is like the snakebite but on the upper lip instead of the lower lip. 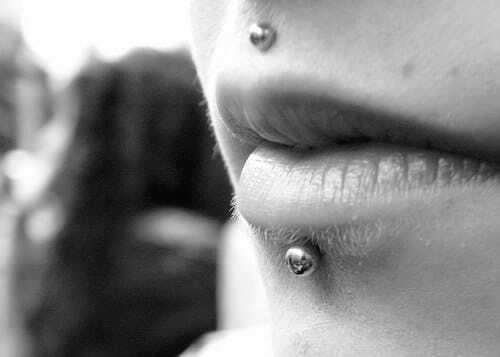 These piercings are similar to the Monroe lip piercings, the only difference is that they are on both sides on top of the upper lip instead of one side. It is basically a combination of a Monroe and Madonna Piercing. 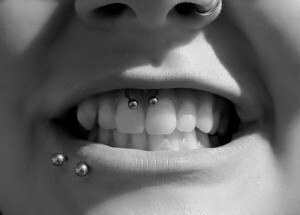 The Cyber Bites Piercing is a combination of the Medusa and Labret piercings – one piercing done in the center just above the top and just below the bottom lip. These lip piercings are opposite of each other. One is in the middle of the upper lip and the other is on the lower lip. The Dolphin Bites Piercing are two piercings centered on the lower lip, similar to the snake bite piercing, but closer together. These are two lip piercings that are placed at the center of the lower lip or just below the lip. Some people place them a little bit lower or even in the lowest part of the lip. The Dahlia Piercing is done at the corners of the mouth. 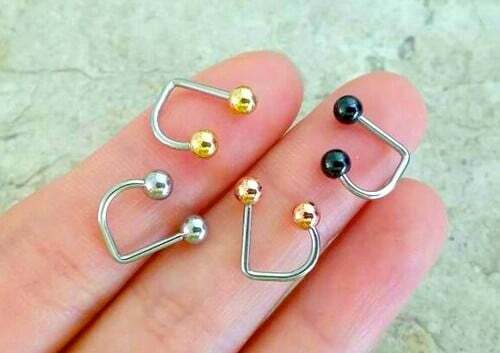 It’s more common to see this piercing done in pairs though it doesn’t have to be. It is another variation of the labret piercing and each corner has one piercing. Most popular is to put two steel balls but, sometimes rings will be used too. The Canine Bites Piercing are single piercings done on both sides of both the upper and lower lips. Basically, a combination of the Angel bite piercing and the snake bite piercings, totaling four piercings. The surface of the lip itself is normally not pierced, except for canine bites and horizontal lip piercings. The Shark Bites Piercing is a pair of spider/viper bites piercings – two close together piercings done on both sides of the lower lip, totaling 4 piercings total just like the canine bites. This one is very similar to the snake bite piercing, but the steels are closer together. The general procedure of any kind of lip piercing mainly involves the specialist making marks on the area to be pierced using an antiseptic known as Gentian Violet. Once this is done, forceps are used to stretch out the lips with a bid to line up the marks. The lip is then pierced after this. The final step involves screwing the bead onto the post. The procedure does not hurt as compared to other types of piercing. However, pain is said to vary depending on individuals and on the different types of lip piercings you want. There are several things that determine the cost of a lip piercing: the piercing place, the metal used and the number of piercings you intend to get. Additionally, the costs of lip piercing jewellery vary widely. In most cases, the price of getting a lip piercing ranges from $20 to $120. It is important to clean both sides of the piercing using a salt solution. This is because the piercing is, in most cases, in contact with saliva which contains bacteria. Cleaning ensures the area is not infected and help control swelling and pain. It is also important to make sure you visit a dentist in case the piercing is affecting the color of your teeth. It can take around 4 to 6 weeks for the pierced area to heal and in some cases, it could take less time. Lip piercings are one of the fastest healing piercings that you can get. The saliva generated in the mouth consists of properties that help in fighting the bacteria. It will generally take around 4 to 10 weeks for the entire pierced site to heal. Packaged sterile saline solution with no additives (read the label) or non-iodized sea salt mixture: Dissolve 1/8 to 1/4 teaspoon of non-iodized (iodine-free) sea salt into one cup (8 oz) of warm distilled or bottled water. A stronger mixture is not better. Saline solution that is too strong can irritate your piercing. Saline soaks at least two to three times daily. Simply soak directly in a cup of warm saline solution for five to ten minutes. For certain placements, it can be easier to apply using clean gauze saturated with saline solution. A brief rinse afterward will remove any residue. After that: Some swelling, light secretion of whitish-yellow fluid (not pus). A piercing can seem healed before the healing process is complete. This is because they heal from the outside, and although it feels fine, the tissue remains fragile on the inside. Be patient, and keep cleaning throughout the entire healing period. Even healed piercings can shrink or close in minutes after having been there for years! 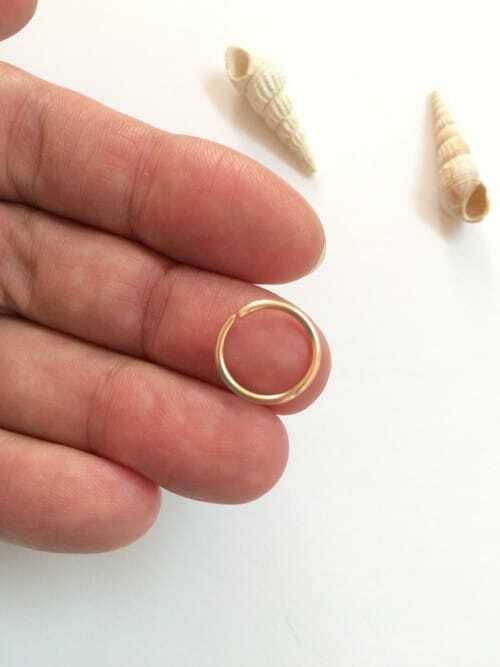 This varies from person to person; if you like your piercing, keep jewelry in- do not leave the hole empty. With clean hands or paper product, be sure to regularly check threaded ends on your jewelry for tightness. 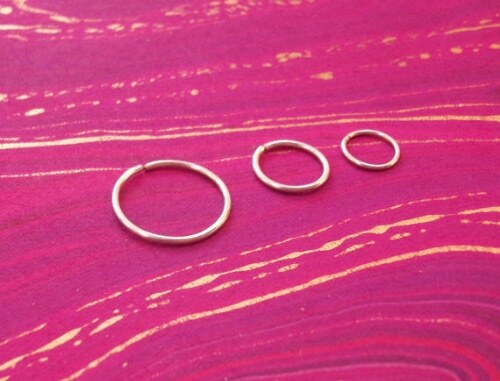 Contact your piercer for a non-metallic jewelry alternative if your metal jewelry must temporarily be removed. Should you decide you no longer want the piercing, simply remove the jewelry (or have a professional piercer remove it) and continue cleaning the piercing until the hole closes. In most cases, only a small mark will remain. If the event of an infection is suspected, quality jewelry or an inert alternative should be left in place to allow for drainage or the infection. Should the jewelry be removed, the surface cells can close up sealing the infection inside the piercing channel, resulting in an abscess. Until an infection is cleared up, keep the jewelry in! The healing period of lip piercings will take between 6 and 8 weeks. Usually, for upper lip piercing aftercare and lower lip piercing, the healing times will depend on how diligent you are in taking care of your lip piercing. In case you’ve encountered any lip piercing problems then it can take time to heal. While your lip piercing is still healing, it is very important that you should take good care of your physical health as well. Be sure to wash your hands with antibacterial soap in order to prevent disinfecting your lip piercing. It is very important that your hands are thoroughly clean each time you touch your piercing. Wash the lip ring with a wet cotton swab that has a small amount of antibacterial soap. Be sure to wipe the crusty stuff or any dried blood. Avoid removing the crusting or scabs from your lip in order to avoid bleeding. Use a wet cotton swab in rinsing the lip ring. Do this twice a day, in the morning and before going to sleep. Rinse your mouth with an antibacterial wash after you have done brushing your teeth. H2Ocean Piercing Aftercare Spray is highly recommended for cleaning lip piercings. It is very effective in eliminating dried discharges and lymph secretions, which usually appear within the first 3 to 4 hours of piercing. It contains sea salt and lysozyme, which can help in reducing the healing time and lessening the adverse effects related to your new piercing. As a result, your lip piercing will remain hygienic throughout the healing period. There are a lot of ways that you can do in order to keep your lip piercing clean and dry. One of them is to use Dr. Piercing Aftercare swabs. Just dip the swab cotton in water and put a small amount of antibacterial soap on it. Use this cotton swab in cleaning any dried blood or crust around your jewelry. Keep in mind that you should not remove the scab or crusting from your lips since this can cause bleeding. Don’t worry, it will just come off naturally. Piercing Solutions is the best natural solution for healing new piercings. It is made of sea salts which are rich in vitamins and minerals. At the same time, it has tea tree oil that can help in healing your piercing faster. All you have to do is soak a cotton ball into the solution and hold it on your lip piercing for five minutes. Do this twice a day. Sea salt includes vitamins and minerals that can make your skin healthier. It can help in soothing any damaged skin. Tea tree oil can reduce the healing time of your lip piercing. It can help in healing any bumps that will occur on your piercing. After you have finished eating, it would be a good idea to rinse your mouth with a nonalcoholic, antibacterial mouthwash. Let it stay for 30 to 60 seconds so the food particles will be flushed out from your lip piercing. CloSYS Original Unflavored Mouthwash is specially designed for people who have sensitive mouths. It does not contain any alcohol which can burn your mouth. It works gently yet effectively. As much as possible, try to eat only soft and cool foods such as yogurt, ice cream, etc. Do not attempt to eat solid foods, since this can be trapped in the piercing. Avoid drinking alcohol and do not smoke. Alcohol can dry out your piercing while smoking can irritate your lip ring. Do not emerge yourself in the water for a long period of time. This means that you should not go for long showers or swimming. Keep your lip ring clean at all times. Use a saline solution in sanitizing it. Avoid using too much saline solution since it can dry out your lip piercing. Keep your lip piercing safely from any infection by rinsing your mouth with an antibacterial wash. This can remove any germs from your mouth. Use a dry tissue in keeping the piercing area dry. 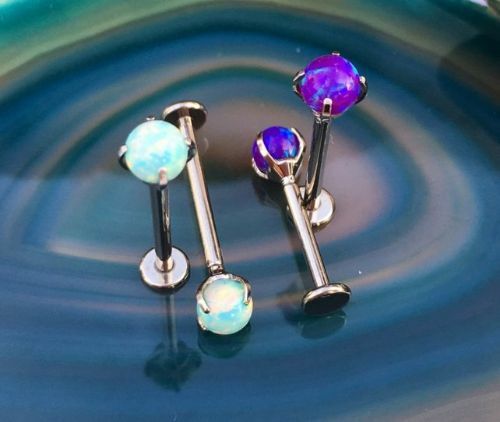 Dry your piercing right after it gets in contact with food or liquids. In conclusion, if you decide to get a lip piercing, it is important to make sure you get it done by someone who is qualified. This will ensure you do not have any serious side effects from the procedure.